Metaphysical education. 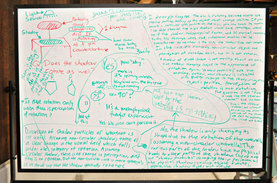 Lifeguard Eliya Cohen '15 presents philosophical whiteboard to inquisitive Reed swimmers. Photos by Jenn McNeal '14. The German philosopher Martin Heidegger said the best place to think philosophy was in a hut deep in the Black Forest while a storm raged outside. That may have been true for Heidegger, but it is not necessarily true at Reed, where a robust metaphysical debate has broken out in an unlikely location--the swimming pool. Visitors to the sports center will notice that the poolside whiteboard no longer displays lap times and opening hours; over the last month it has sprouted a fascinating sequence of questions, claims, and rejoinders that have grown to fill every square inch. 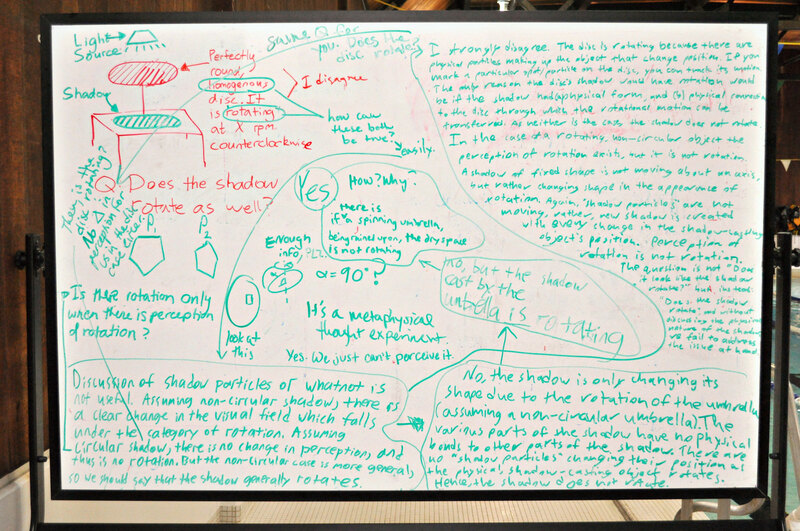 The debate began when philosophy major and lifeguard Eliya Cohen '15 asked fellow philosophy major Finn Terdal '12 to jot down some problems of metaphysics on the whiteboard to ponder during her shifts. The questions soon provoked students, alumni, professors, philosophers, physicists, and other sentient life forms who frequent the pool. Spinning disc and light. Does the shadow rotate? The problem that sparked the most interest (top left, in red) was a metaphysical question of light and shadow: A perfectly round, homogenous disk is rotating at X rpm counterclockwise in suspension above a flat plane. A light source exactly overhead shines on the disc. Does the shadow cast by the disc rotate with the disc itself? "Discussion of shadow particles or whatnot is not useful. Assuming non-circular shadow, there is a clear change in the visual field which falls under the category of rotation. Assuming circular shadow, there is no change in perception, and thus is no rotation. But the noncircular case is more general, so we should say the shadow generally rotates." "I strongly disagree. The disk is rotating because there are physical particles making up the object that change position. If you mark a particular spot/particle on the disc, you can track its motion. The only reason the disc's shadow would have rotation would be if the shadow had a physical form, and a physical connection to the disc through which the rotational motion can be transferred. As neither is the case, the shadow does not rotate. In the case of a rotating, non-circular object the perception of rotation exists, but it is not rotation. A shadow of fixed shape is not moving about an axis, but rather changing shape in appearance of rotation. Again, shadow particles are not moving, rather, new shadow is created with every change in the shadow-casting objects position. Perception of rotation is not rotation. The question is not "does it look like the shadow rotates?" But instead: "does the shadow rotate," and without discussing the physical nature of the shadow we fail to address the issue at hand." 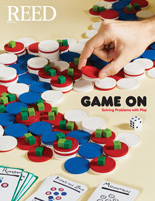 As with many philosophical questions, consensus has proven elusive. No word yet on whether the philosophical contemplations have improved the swimmers' strokes-- or vice versa. Sometimes the life of the mind is best lived underwater.